C P Sharma did B Sc in Chemistry, Botany & Zoology followed by an M Sc in Forensic Science from Punjabi University, Patiala. He joined Wildlife Institute of India in 1994 and his thrust area is identification of wildlife parts and products encountered in wildlife trade. He is a Senior Technical Officer at Wildlife Institute of India. Forensic science is the application of science to criminal and civil laws, mainly on the criminal side during criminal investigation, as governed by the legal standards of admissible evidence and criminal procedure. Wildlife forensic science is forensic science applied to legal issues involving wildlife. 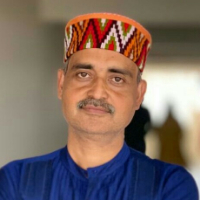 "After completing my B Sc in Chemistry, Botany & Zoology and M Sc in Forensic Science from Punjabi University, Patiala, I joined Wildlife Institute of India in 1994 and since then I am working at WII as a Senior Technical Officer there."